But he is actually a real person! Not only is he real, but he shares with us how he created a formula to turn events into 6-figure earnings. 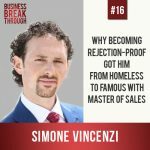 Simone shares his incredible journey – a typical rags-to-riches story with an atypical twist on the humanity of it all. 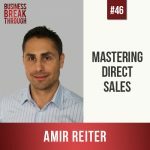 He talks about the drive behind it and how he became rejection-proof, as well as his struggle to balance running a massive company and business and also dedicate the time and energy necessary to his new marriage, to build a strong relationship and not repeat mistakes from his past. 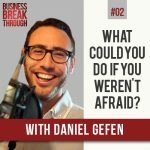 Daniel Gefen is the #1 international bestselling author of “The Self Help Addict”, award wining podcast host of “Can I pick your brain?” and founder of the Gefen Media Group amongst other ventures. Daniel is my podcasting guru, as he has helped me launch the show you are currently listening to. He has the unique ability to be vulnerable without being self-effacing, letting others learn from his struggles as they feel good for his accomplishments and appreciate his realness. In this episode we talk about how you can work smarter from your place of strength and how far you can fly when you are able to overcome your fears.